Motorcoaches are are just like big cars that can hold a lot of people a long ways right? WRONG! A lot of people do not realize how motorcoaches operate, how they move, what makes them move, and why they are so expensive. This blog is meant to help you realize what really goes into these wonderful, massive, beautiful, people moving machines. To start this off, I just want to make sure everyone knows that these facts are true about all of our Arrow Stage Lines motorcoaches, not every company. But with that being said, most motorcoaches operate the same, so things will be very similar. 1: Arrow Stage Lines Setra motorcoaches have over 2.2 miles of wire and 1389 electrical connections. In any average motorcoach, the main center tunnel of wires has over 700 wires in it. All of these wires and connections help to power the video screens, over 100 light bulbs, engine connections, radios and speakers, wifi, and many more electrical components on a motorcoach. All of this is to help keep you comfortable, entertained, and safe while traveling down the road. 2: A motorcoach has a massive engine with over 500 horsepower to push the up to 54,000 pounds of weight in the vehicle. This is the equivalent of over 7 full sized elephants! These massive motorcoaches have 8 tires that help keep them going straight down the road. 3: When arriving at its destination, a group riding on a motorcoach will spend on average $10,950 during an overnight stay. (food, accommodations, other spending) This is a huge number that many people do not think about. In a small town, or an area of a city, this can have a huge economical impact on the businesses and areas around it. 4: Some people have said that riding in a motorcoach is the most economical way to travel. Well, they in fact would be correct. 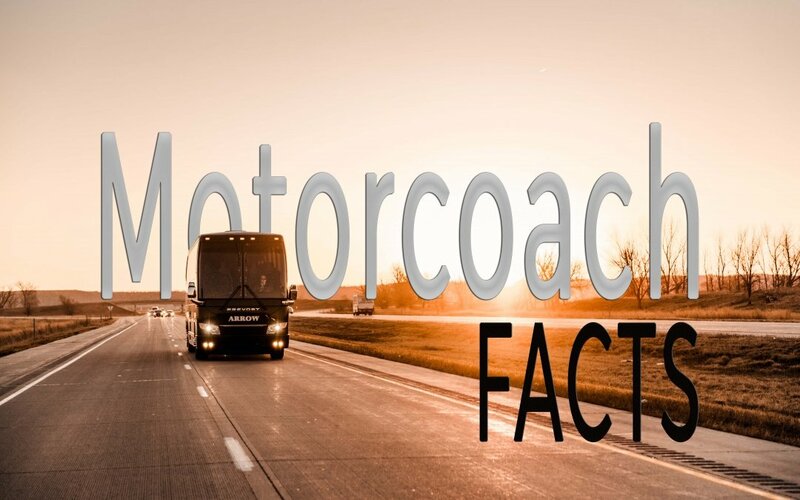 A motorcoach on average gets about 210 passenger miles per gallon. (MPG) This beats out all other planes, trains, and automobiles. Take the bus, make an impact on the world. It’s that easy! 5: The standard motorcoach is 45 feet long and 12 feet high. It has enough space for 54 passengers, a driver, and all of their luggage, and yet it can make a tight right handed turn onto a 2 lane road. How is this done some may ask. Well, motorcoaches were made to travel in cities on tight roads as well as cruise on the interstate at high speeds. The wheel base is at a perfect length that it lets a 45 foot motorcoach make a tight turn, but it also gives it enough stability at highway speeds. If you listen to a group of people gasp as you make a tight turn in a motorcoach, that is usually because they are so impressed such a large vehicle is able to do that! 6: Wifi? Movies? DirectTV? HDMI? Find My Coach? These are many questions that the average customer asks for, and here at Arrow Stage Lines, we can usually deliver! These motorcoaches are now so technically advanced when it comes to a entertainment system setup. With options like DirectTV, DVD, WIFI, and HDMI plug ins, you can do about anything when it comes to visual entertainment. All of the motorcoaches also come with mega sound systems, supported by subwoofers built into the ceilings and floors. It is like being in a traveling cinema at 68mph. 7: $$$ Most people do not realize how much the average motorcoach cost in 2017. Most companies do not like to say how much they paid exactly on a motorcoach, but one thing you can be for sure of, and that is that it is above the one half million dollar mark! These graceful beasts we call motorcoaches have so many moving parts and are so large, that everything seems so expensive. It all comes down to passenger comfort and safety in the end, and at Arrow Stage Lines, that is a standard, not a goal of ours. Although I could go on and on about more facts of a motorcoach (you would get bored), I will sum it up with this. Like any production or business, there is a lot more that goes into what you see. These amazing machines are mind blowing when it comes to the electronics, engine systems, interior comforts, and safety systems when you find out how they truly work. Next time you are on an Arrow Stage Lines motorcoach, take a look around, you will be surprised the attention to detail when it comes to every single moving part involved. To book your next trip on these beautiful motorcoaches we have been talking about, click here! To learn more about Arrow Stage Lines, click here!